Let's showcase your research poster! 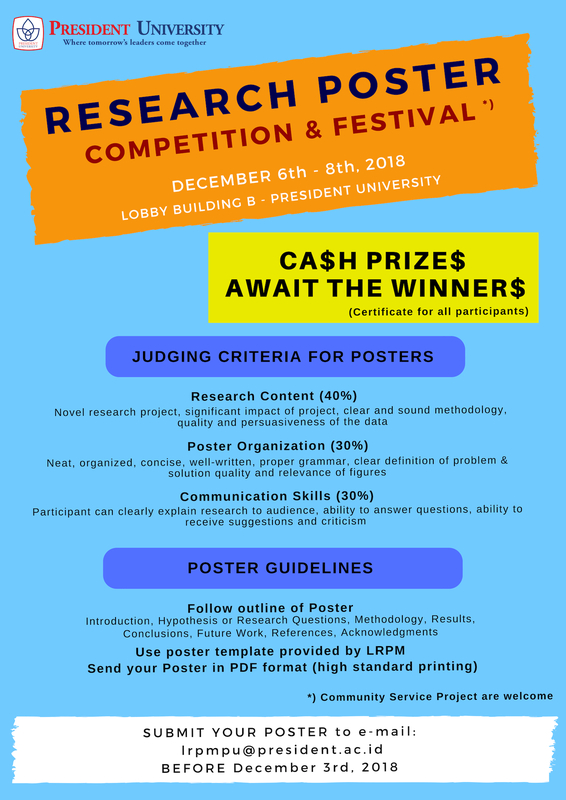 In the effort to increase the interest and promote research, President University invites all of the students to participate in "Research Poster Competition & Festival". Introduction, Hypothesis or Research Questions, Methodology, Result, Conclusion, Future Work, Reference, Acknowledgments. Please use poster template provided by LRPM attached below and send your poster in PDF format (high standard printing) to e-mail: lrpmpu@president.ac.id before December 3rd. 2018. For more information, please find the attached file below or contact lrpmpu@president.ac.id.